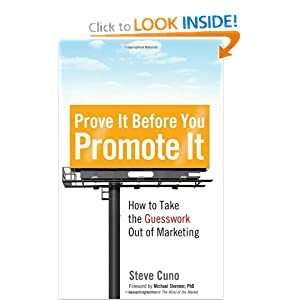 There is a great book titled, “Prove It Before You Promote It“, that I read a while back. It has some very sobering remarks on focus groups and how they are applied in product development. Many companies hold focus groups. They fill a room with 10 to 20 carefully selected respondents and ask them questions. That much is fine. A problem occurs only when companies mistake the resultant feedback for data—and make decisions based on what they hear. Focus groups, with an easy-to-imitate format, are a great place for incompetents to convince themselves and unsuspecting clients that they know what they’re doing. Anyone can convene a group, ask questions, and write up the answers. Amazingly and sadly, businesses actually base big decisions on these groups. They make the package less pink. They open a store on the West Side. They pull their ads from Batman cartoons. And all too often they later find that consumers don’t behave the way they said they would in the focus group. I completely agree. I have written previously about the relevance of focus groups, this book does a much better of job teaching us the pitfalls of misuse of focus groups. What the book says about focus groups – asking a few (leading) questions and taking product decisions based on the feedback of handful of people- is very relevant to basing product and startup strategy based on the interviews with handful of customers. When you are talking to customers, you are still forming hypotheses not testing them. The hard part is not testing the hypotheses, but forming better hypotheses to test. Focus groups and customer interviews help us make better and testable hypotheses. If you are in marketing, run a startup, manage a product or do A/B tests you definitely should read this book. I believe the problem with focus groups is that they rely too much on what people say they want, and not enough of looking at actual behavioural patterns of your customers. Humans are notoriously bad at articulating what they want. But what their behaviour and it will tell you most of what you need to know about them.